Joyce Wycoff Connecting through Art: Why Is Whining Easier? My friend Doris gave me a gentle nudge this morning ... I haven't posted a message for a week. I could plead busyness but the truth is stranger than that. Things are going so perfectly I don't have anything to whine about. Which makes me wonder why whining is so much easier than ... what is the opposite of whining ... bragging? That's the problem ... talking about the perfection of life seems like bragging ... like the hubris of tempting the gods. But why shouldn't we talk as freely about all the goodness that comes our way as the trials and tribulations that make us reach out for the comfort of others? Currently I am bowled over by the perfection of my life. And while I know that "this, too, shall pass," if I don't revel in the gloriousness of this present abundance, aren't I just inviting it to leave? Shouldn't I speak each instance of perfection just as much as I examine each moment of darkness. Isn't perfection lurking in both? While we know each trial contains a gift and a lesson and part of our spiritual journey is to find and appreciate the perfection of those trials, we ... or at least I ... almost skip over the glorious moments as if they are only gifts and don't carry their own lessons. My life right now is perfect in so many ways but perhaps the most challenging for me to accept is "the house." After my husband died three years ago and his income was lost as well as most of mine as I cared for him, I decided to let my house go into foreclosure. My penance for this financially irresponsible act was to live my life as a renter, or so it seemed. But, as I transitioned from renting in Colorado to renting in California, something happened which I can only view as the Universe intervening. Here's the storyline: I fell in love with a house on March 23rd but knew there was no way that I could qualify for a mortgage. So I tried to get a lease option but the sellers didn't want that. I gave up, moved on, tried to forget about it. Yet, through a series of miracles, one month, to the day, later I had a pre-qualification letter on a loan and was in escrow. There are so many ways this story wouldn't have happened that it has to be a miracle. If the rental market here in the foothills hadn't been practically non-existent, I wouldn't have considered buying. If a real estate agent hadn't asked me if I was sure I couldn't qualify for a loan, I wouldn't have even considered the possibility. If a mortgage banker, called at random, hadn't checked on the details of my foreclosure and realized that I was now in the "safe" zone, I wouldn't have bothered trying. And, most amazingly of all, if an absolutely spectacular house hadn't sat on the market gradually dropping in price till it reached my price range, it never would have happened. I swear it was waiting for me. And, the lesson in all of this can only be gratitude and a great longing to be worthy of this miracle. 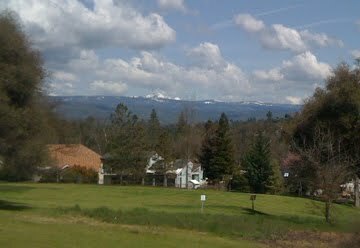 About the image: this is the view from my new front porch ... or at least it will be in about a month assuming all goes well with escrow. Wonderful to have your words today. I don't ever think of what you write as whining. Nor is its opposite necessarily bragging. Each of us is, I think, entitled to share our joys. Happiness begets happiness. A big congratulations on "the house"! Just fabulous. I must say, that view is stunning. Who could not have joy on waking to that?! Ah lovely Joyce -- it isn't bragging -- you're celebrating life for all it's worth. And you are so right -- your vision of 'good fortune' will pass you by if you don't claim it! Love the view -- WOW! I vote our first 'wild women of wonder' meet at your house. Okay -- so I just made up that name and I just created a 'first' -- but then, we didn't do it this spring! Hugs and congratulations! Ask for what you want and the universe delivers!